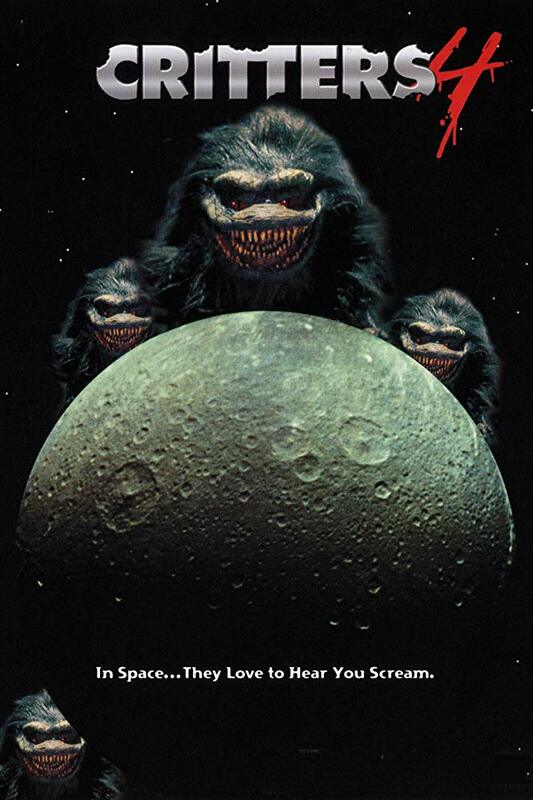 John’s Horror Corner: Critters 4 (1992), finally bringing the alien man-eating Crites and a stellar cast into outer space. MY CALL: The best violence, gore, effects and humor will always be found in parts 1 and 2. But, however inferior to them, this remains an entertaining, campy and somewhat worthy sequel to the franchise. 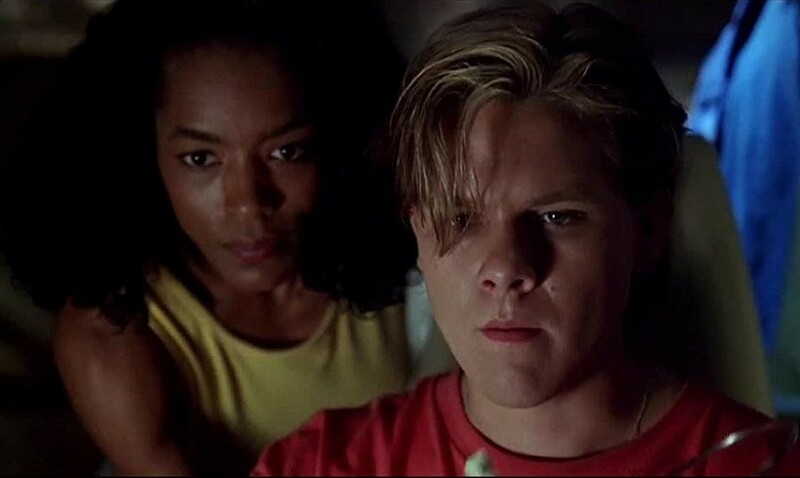 MORE MOVIES LIKE Critters 3: Critters (1986), Critters 2 (1988), maybe skip Critters 3 (1991), Gremlins (1984), Ghoulies 2 (1988), Tremors (1990), Grabbers (2012)… maybe even Munchies (1987) and Hobgoblins (1988). Leprechaun (1993) is also a decent R-rated horror comedy follow-up for fans of Critters. Of course, the Critters started out in space and came to Earth. 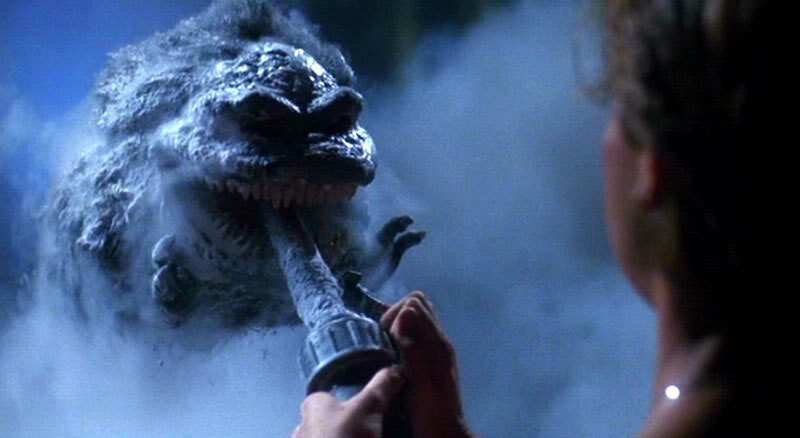 But Critters (1986) was not a horror-in-space movie. 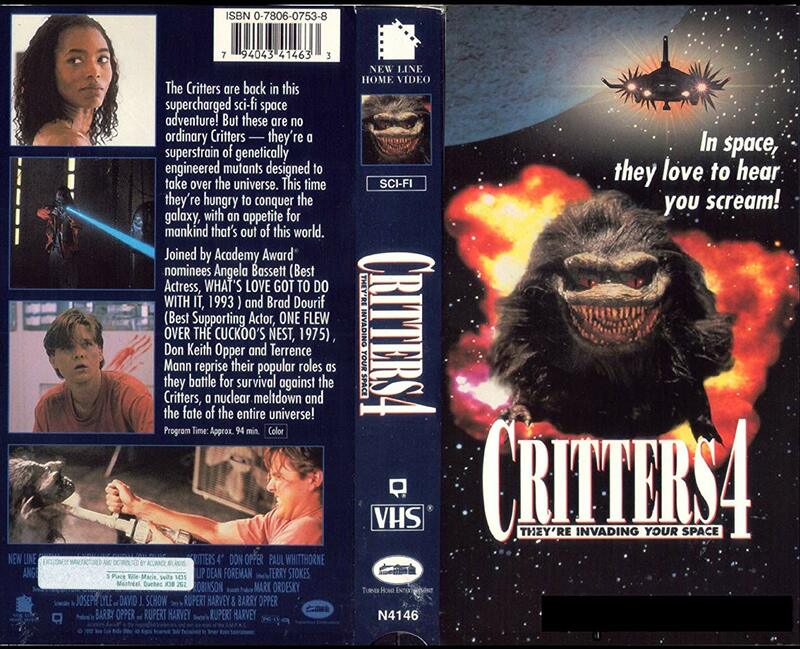 Despite that, the Critters franchise took a turn and boldly had a movie setting “in space” well before Jason Voorhees, space Satan, the Leprechaun or Pinhead ever did—Jason X (2001), Event Horizon (1997), Leprechaun 4: In Space (1996), Hellraiser IV: Bloodline (1996). This is an interesting step considering that right before these movies, Poltergeist III (1988), Friday the 13th part VIII: Jason Takes Manhattan (1989), Critters 3 (1991), Hellraiser III: Hell on Earth (1992) and Leprechaun 2 (1994) took their small scale domestic settings to the big city. FRANCHISE SIDEBAR: In part 1, a batch of critters escaped a maximum security “prison asteroid” and were followed to Earth by shape-shifting intergalactic bounty hunters. With the help of a teenager and the town drunk, they thought the threat was eradicated and Charlie (Don Keith Opper; Critters 1-4) joined the ranks of the bounty hunters. But remember how part 1 ended with a clutch of eggs? Well, after yet another deliciously cheesy Sci-Fi spaceship opening, the alien bounty hunters received orders to return to Earth and eliminate the remaining monsters. So in part 2, Charlie and bounty hunter Ug saved the town yet again. However, they clearly didn’t complete the mission successfully because in part 3 we actually begin again near Grover’s Bend, Kansas where this all started and end up in Los Angeles. The last five minutes of Critters 3 (1991) are also the replayed first five minutes of Critters 4. Charlie (Don Keith Opper; Critters 1-4) finds critter eggs in the basement of the Los Angeles apartment building and gets an interstellar call from his old bounty hunter buddy Ug (Terrence Mann; Critters 1-4) informing him that they are the very last two of eggs of the species and they are to be preserved in a space pod that crashes into the building. Charlie haphazardly is trapped inside with the eggs. A space salvage crew recover the space pod in the year 2045 with the critter eggs and Charlie inside—not unlike finding Ripley in Aliens. You’ll recognize a lot of familiar faces in this movie playing crewmen Al (Brad Dourif; Cult of Chucky, Curse of Chucky, Halloween I-II), Captain Rick (Anders Hove; Subspecies 1-4), Bernie (Eric DaRe; Twin Peaks, Starship Troopers) and pilot Fran (Angela Bassett; Vampire in Brooklyn, Contact, Innocent Blood). They get just enough personality for me to care (a little); Bassett gets an equally empowering and mildly exploitative shower scene, Dourif has some cheeky lines, and Hove is just despicable (and predictably gets what he deserves). Director Rupert Harvey—producer (The Blob, Critters) of several films but director of only this one film—delivers the sequel we deserve after suffering through Critters 3 (1991). 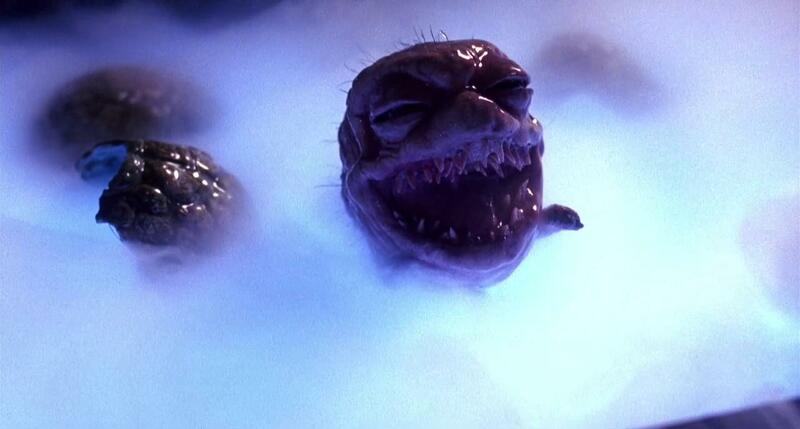 The baby critters are still campy and cute and menacing, there’s a great critter-in-the-mouth special effects scene that reminds me of the black cat from Tales from the Darkside: The Movie (1990), and the space setting works to our fun advantage. 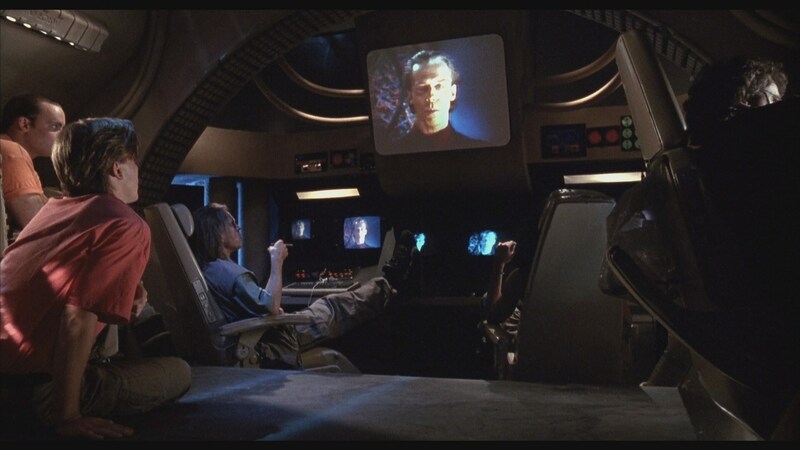 The on-ship computer (named Angela) is reminiscent of Alien’s Mother or 2001’s HAL, and TerraCor (those who want the critter eggs preserved) smack of Aliens’ Weyland Yutani. In fact, numerous scenes are modeled directly after Alien (1979) and Aliens (1986). The best violence, gore, effects and humor will always be found in parts 1 and 2. But, however inferior to them, this remains an entertaining, campy and somewhat worthy sequel to the franchise.